Trevor Micucci’s first season in the Eastern Hockey League was an excellent one and today the EHL recognized him for it, naming the Hamburg, NY native Goaltender of the Year. Micucci, a 6-foot 175 lb netminder is in his first year with the Philadelphia Little Flyers after spending the last two seasons with the Buffalo Jr. Sabres U16 team and helped lead his team to their first ever regular season championship. 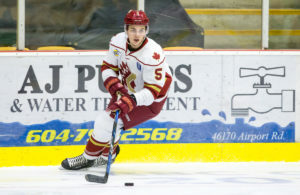 Once the dust settled on the regular season, Micucci found himself in familiar territory at the top of the goaltending statistics with 19 wins (T-1st) while also ranking 2nd overall in both save percentage (.938) and goals against average (1.69) and also managed just a single regular season loss and one shootout loss all season. 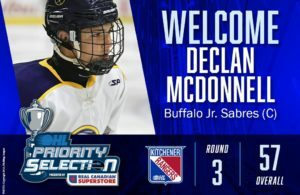 In May the Bloomington Thunder of the USHL selected Micucci after his second Jr. Sabres season and with an opening in Bloomington next season, Micucci might very well play his way on to the 2015-2016 roster.